Herbicide-resistant hybrids and varieties have been planted on a majority of corn and soybean acres in the U.S. for many years (Figure 1). The vast majority of these hybrids and varieties are resistant to glyphosate. 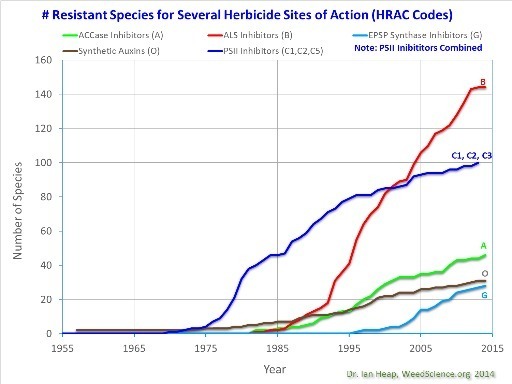 The last 15 years can rightly be referred to as the “glyphosate era” of weed control. Glyphosate rapidly replaced other herbicides in soybean and by 2002 was used on 79% of soybean acres in the U.S. (Young 2006). A 2003 survey of Indiana soybean growers found that glyphosate was the only herbicide applied on 74% of glyphosate-resistant soybean acres (Johnson et al. 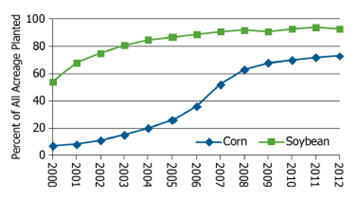 2007) and 65% of total soybean acres. Adoption was slower in corn, but by 2010, glyphosate had become the most widely used herbicide in corn as well, with 66% of U.S. corn acres treated (USDA NASS 2011). Many areas are now transitioning into a post-glyphosate era with glyphosate-resistant weeds now requiring additional or alternative management tools for satisfactory control. To date, glyphosate resistance has been confirmed in 24 weed species worldwide, including 14 in North America (Heap 2012). In plants, glyphosate disrupts the shikimic acid pathway through inhibition of the enzyme 5-enolpyruvylshikimate-3-phosphate (EPSP) synthase. The resulting deficiency in EPSP production leads to reductions in aromatic amino acids that are vital for protein synthesis and plant growth. So, Glyphosate is blue line G, the lowest and most line. But it only takes one mutant weed. In 2004, a farmer spotted palmer amaranth, also known as pigweed, invading his cotton fields in Macon County, Georgia. Given that almost all cotton grown in the state is genetically engineered to be resistant to glyphosate — the main ingredient in Monsanto’s Roundup herbicide — palmer amaranth’s creep into Georgia cotton fields meant the weed had built up a resistance as well. And soon, palmer had spread across the state. Nothing could kill palmer. It can grow to seven feet in height, drowning out cotton plants and destroying farm equipment. A few farms lost the palmer battle and closed up shop. No wonder they call it a superweed. On top of tillage, farmers increased the amount of herbicides used on their crops. 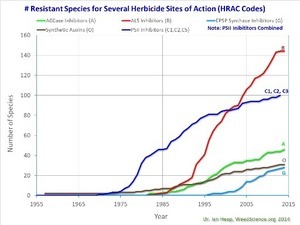 Before palmer, herbicide costs hovered around $25 an acre. In palmer’s wake, that amount increased to $100. In addition to the $15 million spent on labor to hand-weed rows of cotton, Georgia farmers spent well over $100 million fighting one weed in one crop. So much for GM proponents’ claims that GM crops reduce herbicide use. Another thing that runs up local costs is hiring people to pull up the mutant pigweed by hand. Plowing and cultivating seems a lot easier to me. The article makes a bunch of excuses for why organic cotton isn’t much grown in Georgia, but doesn’t have any other solution for mutant pigweed. 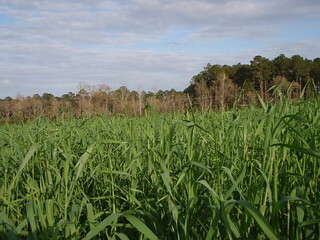 Oh, it does get around to talking about winter rye cover crops, calling it “a culture change”. How soon they forget! My father planted winter rye, and so do I. And he didn’t “burn down” the rye by spraying glyphosate on it, either: he plowed it under, and so do I. I don’t grow cotton, but I do grow corn, okra, and other vegetables, and we have very little pigweed. And we spray zero, no, zilch pesticides. Cotton was king before and may be again now, but it also fell way off in between as other crops became more profitable. Maybe it’s time for that in Georgia. Organic farming of other crops is indeed booming. Crop rotation, plowing, cultivating: these things are less expensive than GM seeds and pesticides, resulting in more profit. Oh, and without poisoning the food supply or the water supply.